Colle says there were 5,000 reported “pump-and-run” thefts in the GTA last year, but that police believe the number could be double that. However, the provincial labour minister at the time, Linda Jeffrey poured cold water on the idea noting serious concerns, including financial feasibility, from industry stakeholders. Vaishali Prajapati doesn’t sleep much anymore. 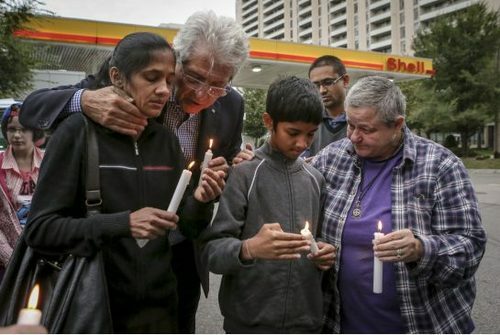 Even a year after her husband Jayesh was killed in a “gas-and-dash” at a west-end Shell station where he worked, “every night I think he is coming from his job,” she says. Her mind hasn’t accepted that the caring man who bathed and dressed her for a week when she broke her arm, played chess with their 12-year-old son every Sunday and worked six days a week to make ends meet is gone. When a man with a $112.85 gas bill took off without paying, Prajapati, 44, tried to stop him. The silver SUV struck and dragged him through the gas station. He died soon after in the hospital. He did what he thought was right, and paid with his life, says Vaishali. On the anniversary of his death, friends and family gathered at the corner of Marlee and Roselawn Aves. for a candlelight vigil. Vaishali’s quiet voice gets even softer as she searches for words to describe the pain she and her son Rishabh now live with. Meanwhile, the man allegedly responsible remains at large and a provincial bill promising harsher penalties for gas thieves and protection for gas station employees is stuck in committee stage. Max Edwin Tutiven, 40, is wanted on a Canada-wide warrant for second-degree murder. Tutiven has a long criminal record, including convictions for three gas thefts in 2006. He has two outstanding warrants for gas theft in Toronto and a third in Montreal. Abdullahi Mohamoud, charged with criminal negligence causing death in a similar hit-and-run death of a 62-year-old Mississauga gas attendant in May 2011, is also still at large. That Tutiven continued to steal gas after being convicted means that stiffer punishments are needed, says Vaishali. “I strongly believe the prepaid pumps are the very best option to avoid incidents like this in the future,” she adds. A private member’s bill reintroduced by MPP Mike Colle (Eglinton-Lawrence) in February includes mandatory pay-before-you-pump legislation similar to what was introduced in B.C. after the death of gas attendant Grant De Patie. Colle says there were 5,000 reported “pump-and-run” thefts in the GTA last year, but that police believe the number could be double that. However, the provincial labour minister at the time, Linda Jeffrey poured cold water on the idea noting serious concerns, including financial feasibility, from industry stakeholders. For now, Colle wants to see oil companies take the initiative to stamp down on employers that make employees pay for gas thefts out of their own pockets — something that would violate the province’s Employment Standards Act. Prajapati’s friends and family allege that his employer told him he had to cover the cost of stolen gas himself. A Ministry of Labour investigation completed in January found no evidence of that. When Vaishali thinks about the future, what keeps her going is her son. She worries that she won’t be able to be there for him like his father would have been, but she is trying her hardest for Prajapati’s sake.